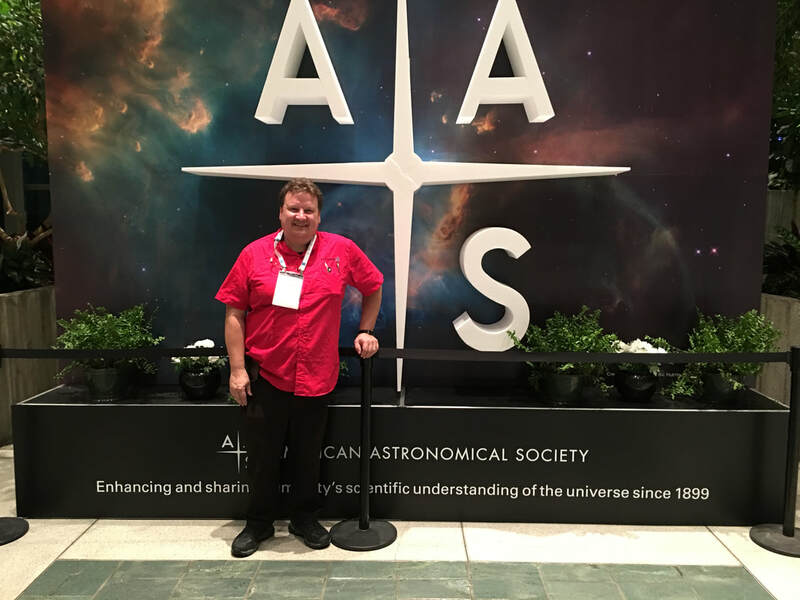 SpaceFab has selected the Supernova Cosmology research program proposed by David Rubin for the grant of observation time on its Waypoint 1 space telescope. 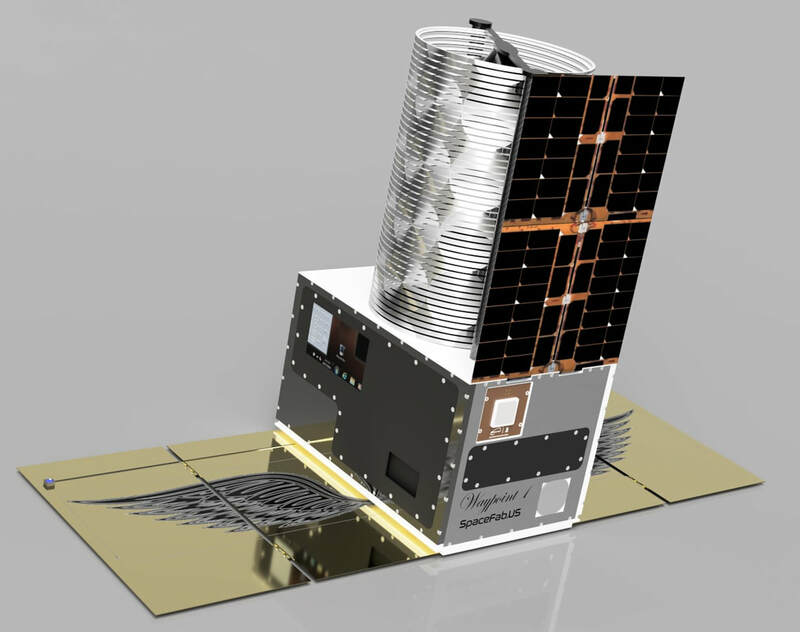 The Waypoint satellite is a multipurpose cubesat space telescope, used for Earth observation and astronomy. The Waypoint 1 will be the first satellite of a constellation of sixteen, and will be launched in late 2020. Distances from type Ia supernovae (SNe Ia) measure distances across billions of years. Together with the redshift of the SN, they trace the expansion history of the universe, constraining the properties of dark energy. However, the progenitors of Type Ia SNe are still not well understood, and could be causing systematic uncertainties in the measurements. Rapid UV observations are key for shedding light on this issue. This program will observe 30 SNe Ia, each discovered early, rapidly targeting them with Waypoint 1 observations. In combination with ground-based data, these observations will enable strong constraints on the astrophysical scenario that yielded the SN. In addition to learning more about these astrophysically important objects, these data will help us to improve the standardization of SNe Ia, enabling us to learn more about the history and fate of the universe. Our last update was October 1, and a lot has been happening since then. 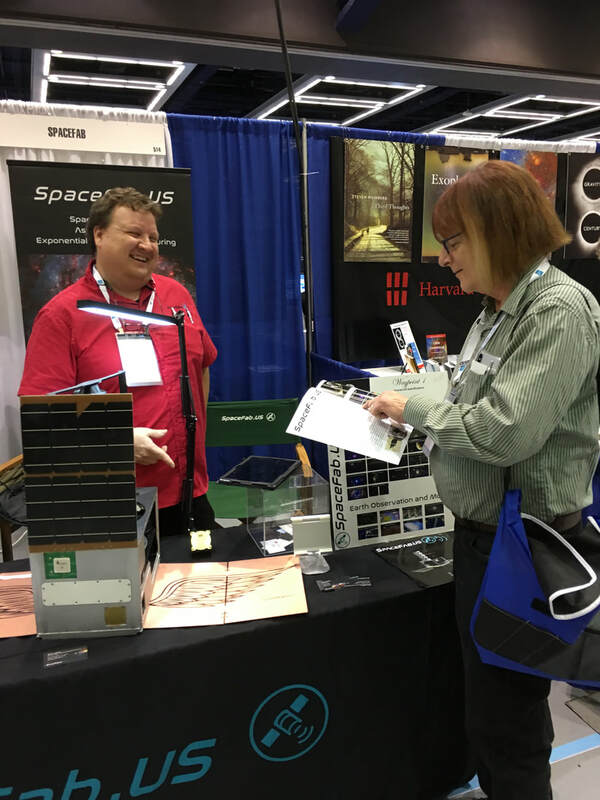 We’ve been very busy preparing for exhibiting at the American Astronomical Society (AAS) conference, which was held in early January 2019 in Seattle. We planned on showing two spacecraft models, one that was entirely made of 3D printed plastic, and one very similar to the flight model with a CNC (Computer Numerically Controlled) milled metal structure. Unfortunately due to the holidays, the metal version took much longer than expected to machine and to have a protective anodized coating applied. We do expect the metal parts to arrive by the end of January. The model was painted with aluminum paint, so it resembles metal. In the picture above, the front side shows two square antennas, one for GPS (on the green printed circuit board) and the gold colored one for a Globalstar radio. There is also a white rectangular plastic panel which insulates the internal optical bench from external temperature variations. 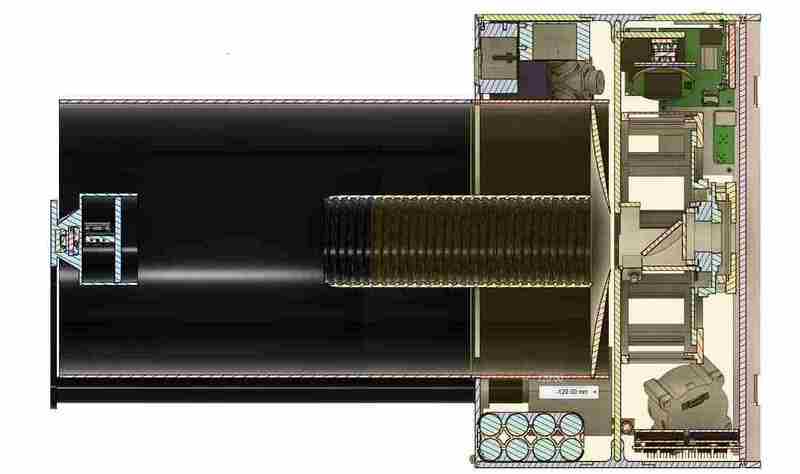 The side of the spacecraft is open, to show the primary mirror in the top half of the spacecraft and the filter wheel in the bottom half. The Android tablet computer screen on the table behind the business cards was used to demonstrate the remote control of the filter wheel. Attendees could use it to move the filter wheel and select the twelve different filter positions. In the flight model, the spacecraft will control the filter wheel directly, but for this demo, the tablet is controlling the wheel via an app and Bluetooth wireless interface. The model also shows the final configuration for the solar panels. The panel with the exposed solar cells is initially folded down to cover the aperture for the telescope. When in orbit, the panel flips up to allow the telescope to extend. The two sets of main solar panel wings are initially folded up into the bottom of the spacecraft, then unfold when in orbit. 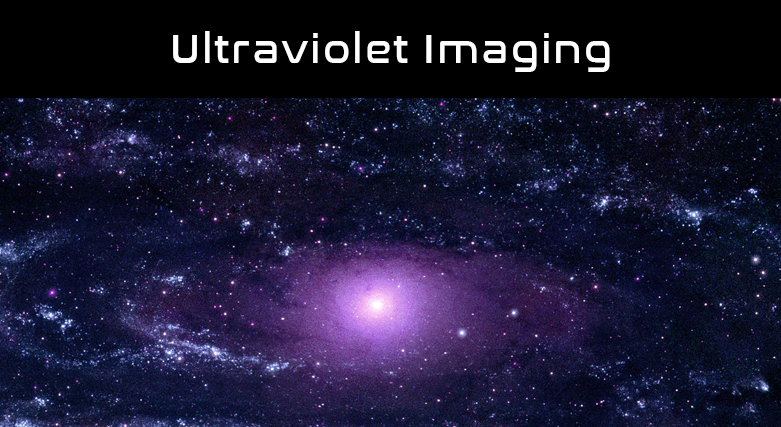 We will be accepting research proposals up to February 28, 2019, and we will announce our space telescope grant winners by March 31, 2019. Now that we are done with the AAS conference, we are preparing our business plan and presentations for discussions with venture capital companies. To assist us with writing and analyzing our business plan, we have added a business advisor, Christof Kern, who is currently CEO of Fibersat, a satellite communications company. While at Fibersat, he secured pre-launch orders of $495 million and government business orders of over $50 million for his company. We appreciate his deep background and experience in business development, strategy, and financial analysis for satellite companies. We are very happy with our latest business plan, and we are now finalizing it and starting work on our Powerpoint presentations. 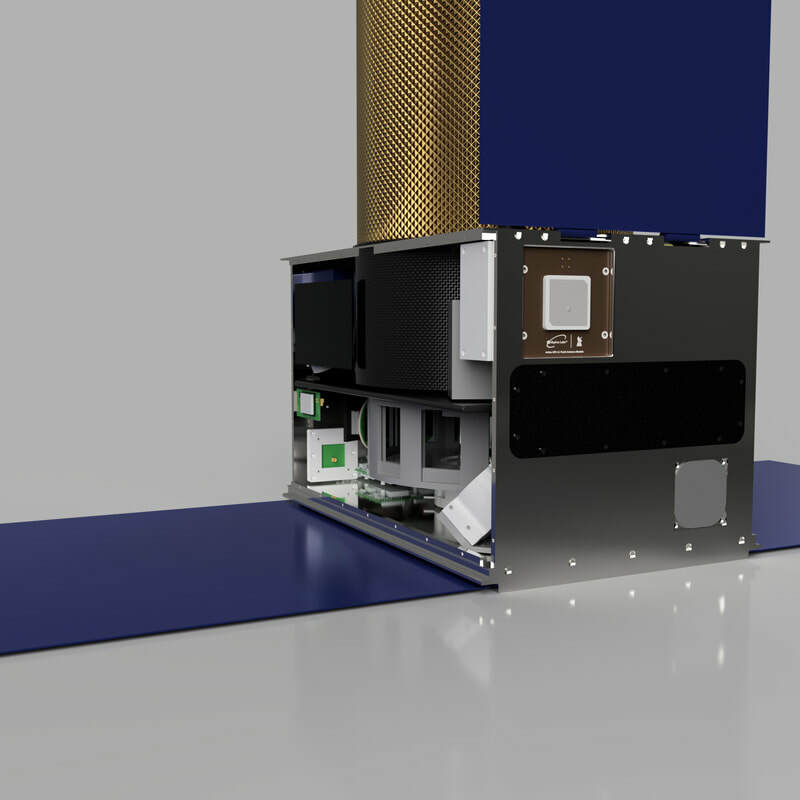 We plan to raise enough funds to finish our first generation space telescope, the Waypoint, and launch it at the end of 2020, then build and launch additional Waypoint satellites for our space telescope constellation every twelve to eighteen months thereafter. And we are very excited about our second generation space telescope, the Viewpoint satellite. It will have comparable resolution to the best commercial Earth observation satellite in existence today, while being more than an order of magnitude less expensive. We will be busy preparing for our next stage of fund raising for the next few months, so we may not be able to update you until April or May. 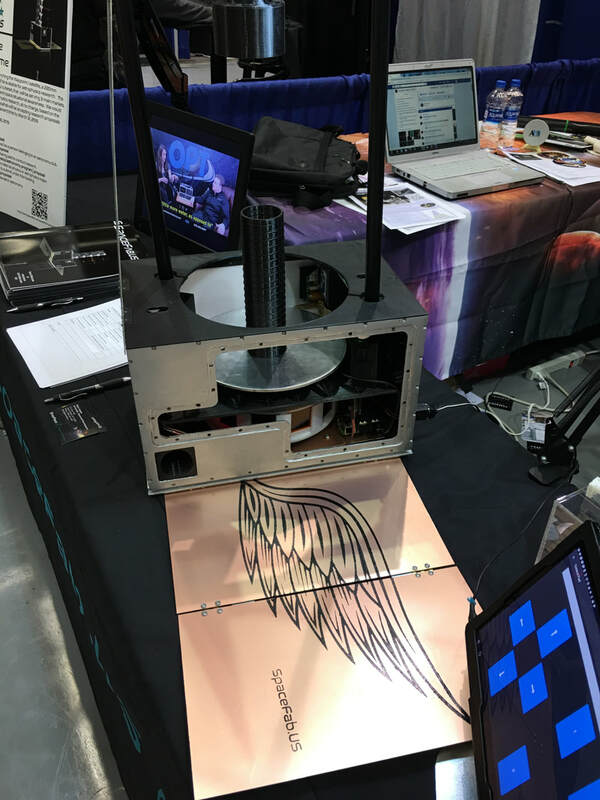 SpaceFab is a company that is currently building a 8 inch space telescope built around a 12U Cubesat. Scheduled for launch in 2020, this space telescope will be made available to everyone. There are plans to launch a network of these space telescopes to be used for everything from taking selfies and taking your own pics of the early universe to looking at your property from space. 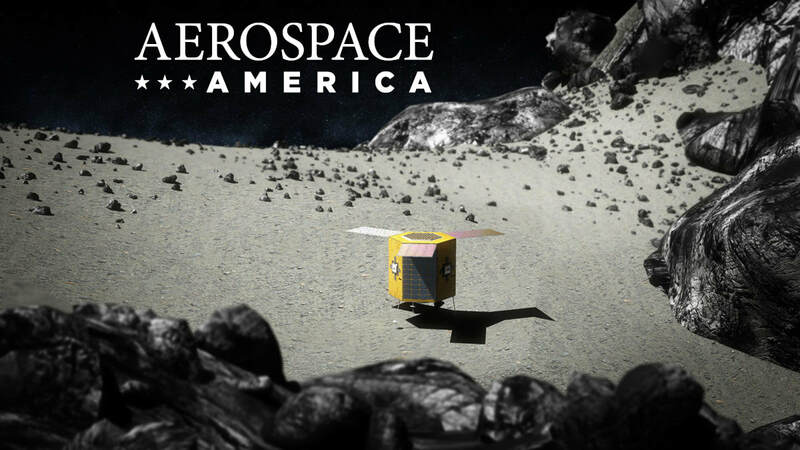 Join us as Tony Darnell and Dustin Gibson discuss this amazing opportunity with Sean League, the Director of Spacecraft Development at SpaceFab. It’s the end of a very productive summer with our interns, Jack and Phil. They have now returned to school, Jack to UC San Diego, and Phil to Cal Poly San Luis Obispo, to start their senior year toward their bachelor’s degree in engineering. ​As a company, we made a tremendous amount of progress in a short amount of time. On the mechanical engineering side, Phil helped us determine that the spacecraft structure would hold up to the stress of launch. The largest rocket launchers typically have the lowest g-forces, around 5 G’s (five times the force of Earth gravity), while the smaller launchers have g-forces of up to 9 G’s. Our satellite structure is designed to handle 9 G’s plus some additional margin, so we can use any of the launch vendors, large or small. We also decided that certain parts of the structure could be made of a high strength engineering plastic. These plastic pieces are strong enough to hold our telescope optics, while keeping the optics thermally isolated from the aluminum walls of the spacecraft. It’s important to keep the optics at the same overall temperature, even if one side of the spacecraft is hot from sunlight while another side is cold by radiating heat out into space. The picture above is a computer generated rendering of the entire spacecraft with the solar panels, secondary mirror, and large light baffle deployed. The light gray or white colored panels are made of aluminum, and the darker gray panels are the high strength plastic panels. The design has five solar panels, four of them folded into the bottom of the cubesat, and the fifth one acting as the aperture cover for the telescope. All of the major mechanical pieces have been designed, and we have been printing the pieces on our big 3D printer for an initial prototype. We have already found a few minor issues and corrected them, and we will be sending the updated designs out to our manufacturing partner to have metal parts machined out of aluminum. This will let us have two spacecraft models, one of plastic so we can make quick checks and modifications, and one of metal that we can use for strength and thermal testing. We have also been working with a number of different vendors for the most complex pieces of our space telescope. We now have a full design of the optics, which includes the sizes, positions, and prescriptions for the three mirrors and four lenses in the main optical path. And we have been working with other vendors on the secondary mirror booms, the fine optics adjusters, and the folding solar panels. These are all things that must move, unfold, or extend at the right time and with the right amount of movement and clearance. We’ve had to make a few adjustments to our CAD drawings to make sure everything fits, but there have been no major issues. On the electronics side, intern Jack made a great deal of progress on the laser communication circuits. The transmitter test board is working extremely well. It can switch several amps of laser current in a nanosecond, so we can transmit data down to the ground at 200 MHz or even a little faster. This corresponds to a data rate of 100 megabits per second. Jack built two versions of the laser receiver test board. The first version had quite a bit of noise, so we tried several different receiver circuits. The second version of the board can actually receive the light pulses at 200 MHz and translate them into electrical signals. However, although the noise level was reduced, the laser receiver board still isn’t sensitive enough. We do have some ideas on how to reduce the noise and boost the sensitivity to the right level, and we’ll build and test a third version. The picture above shows the laser transmitter board on the left, and the laser receiver board on the right, behind a light diffuser screen. The receiver board is mounted to an X-Y stage, so it can be aligned with the laser beam by turning the metal knobs. As far as the laser transmitter is concerned, it is working so well that we are thinking of turning it into a product and selling it. It would be the best overall laser communication module available for cubesats - fast, low power, compact, and low priced. It could be a quick way to get some sales revenue -- but it would be a distraction from our main goal of getting our satellite into space. Our plan is to talk to venture capital companies at the beginning of 2019. If we don’t get interest in our space telescope business plan, we’ll do a slight pivot and turn the laser communicator into a product, while still working on our space telescope. So we will be busy until the end of the year working on our satellite design, refining our business plan, and talking to prospective customers. Good-bye to our 2018 summer interns Jack and Phil - you guys are the best!! ​It’s about half way through the summer, and I must say that our two interns, Jack and Phil, are doing a fantastic job. We're so happy to have their assistance. Jack immediately started work on the laser transmitter, and has already finished designing and building the optical test board. 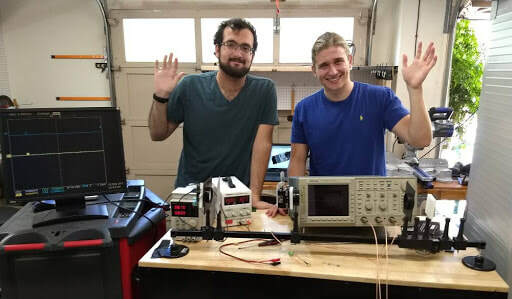 Here’s a picture of co-founder Sean and Jack doing some initial testing of the transmitter board mounted to an optical rail. The transmitter test board is being tested with a low power green laser diode, the type used in a laser pointer. The laser power is low enough (less than 1 milliwatt) to be safe, but just in case, Sean is using his laser safety goggles. We’ve decided not to do any testing with the invisible infrared laser diode until after the interns have left at the end of summer. Testing with the infrared laser will require special safety precautions, and it will be easier if we limit the number of people in our work area. 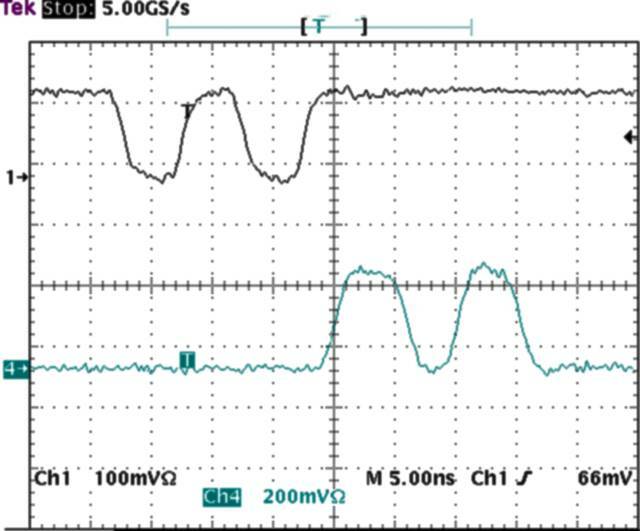 The laser transmitter circuit is working well, running with a 200 megahertz clock, and it’s able to switch 100 milliamps of current in a nanosecond or so. Jack is making one more revision of the board, to verify that it can switch at least a full ampere for full speed operation. 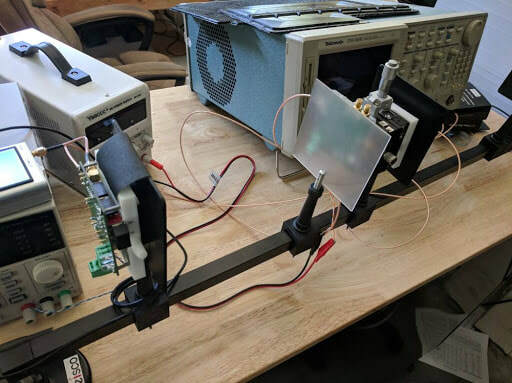 And he is almost finished with the laser receiver test board design, so we may be able to test both the transmitter and receiver working together in a few more weeks. There will be some additional changes because we are still waiting for our optics partner to provide the exact mirror sizes. After all this work, Sean and Phil attended the Small Sat Conference at Logan, Utah to work out some details with our vendors for solar panels, actuators, momentum wheels, radios, and other components. 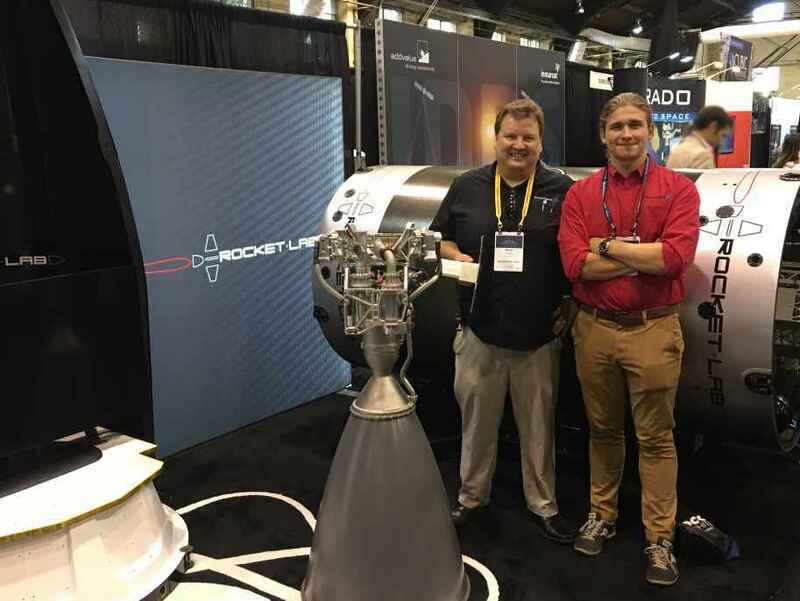 And here they are at the Rocket Labs booth, checking out some of the different ways we can get our satellites into orbit. We’ll update you again at the end of September, after our interns have returned to school. 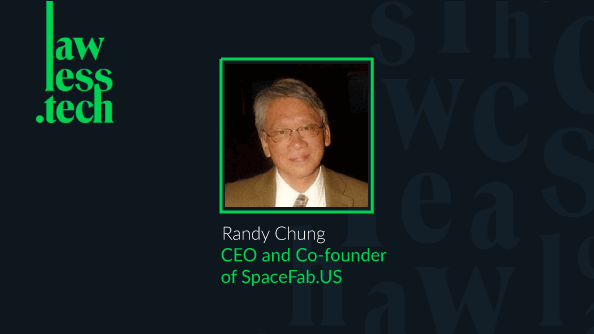 New article by Lawless.tech, interviewing Randy Chung from SpaceFab. They are an online magazine devoted to covering the ongoing regulatory attempts to oversee and control the newest technologies, such as commercial space. ​July 4, 2018 UpdateThe amount raised through Wefunder was a total of $169,397 from 200 investors. After paying various fees, we received a total of $164,315 that was wired in during the last week of May and the first week of June. We immediately put your investment to work by outfitting our laboratory and office space and getting it ready for our summer interns. Below is a photo of the fifteen foot long electronics bench, with CEO Randy setting up a dual Xeon computer for use as a compute server and storage server. We’ll use the server for running mechanical finite element and thermal analysis, as well as electrical circuit simulation. We already had the server, so we didn’t have to spend any funds on it. In the background is co-founder Sean’s personal vehicle, which is a diesel utility truck. Barely visible behind our spacecraft model is our solder rework station, which we'll use to solder and de-solder tiny surface mount components on our circuit boards. We knew in early May that the fundraising campaign was successful, and we immediately started the search for summer interns from top notch engineering schools. We had a number of great applicants, and we wish we could have had more than just two interns. Shown below are the two interns we hired. Phil, on the right in the blue T-shirt, just finished his junior year in aerospace engineering at Cal Poly San Luis Obispo. He started in mid-June, and has already contributed a lot to the mechanical re-design of our space telescope. We wanted to change the spacecraft structural design to make it quicker and easier to assemble and disassemble, and Phil made some finite element and thermal analyses that verified our new approach should work. He will continue working on the mechanical design with co-founder Sean over the next few months. Intern Jack, on the left with the neatly trimmed beard, started work only two days ago. He just finished his junior year in Electrical Engineering at UC San Diego, and he is the president of SEDS, the Students for the Exploration and Development of Space organization. You can see a video of the test firing of their 3D printed rocket engine here: https://www.youtube.com/watch?v=D2ylImcGjDY. 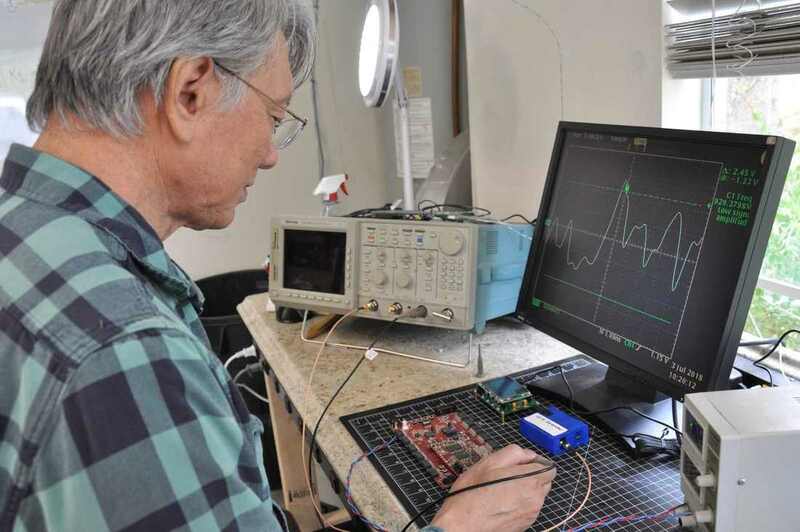 Jack will be working on our optical communications test bed, designing circuitry for the laser transmitter and optical receiver, running circuit simulations, and doing the schematic capture and printed circuit board (PCB) layout. Our goal for him is to be able to order the PCB by the end of July, and to start testing in August. Here’s Phil taking measurements of our old spacecraft model. We are changing the old design because replacing an internal part or making an adjustment to the optics required taking almost the entire spacecraft apart. The new design is much more modular, and should take only a few minutes to access, remove, or insert internal sub-assemblies. We “splurged” and bought a 55 inch TV with 4K resolution to use as a computer monitor and virtual whiteboard -- it was only $250 at Walmart. 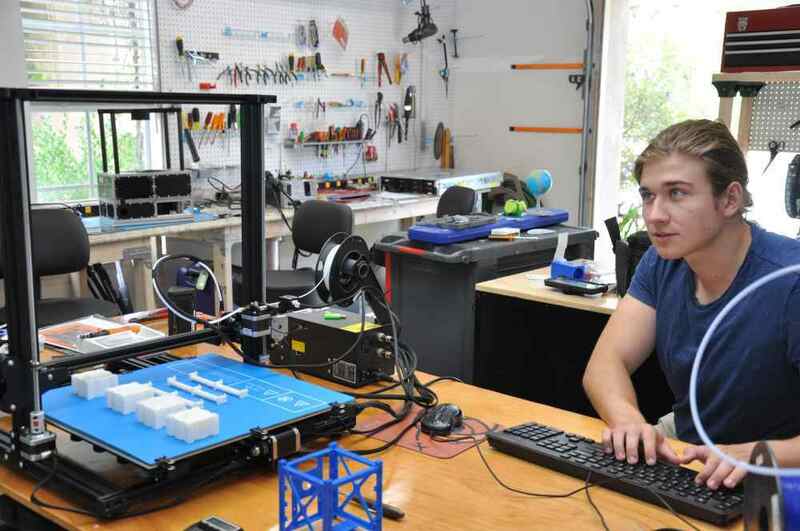 Here’s Phil again, at the bench that's used for 3D printing. The 3D printer is large enough to print all of the parts of our spacecraft model, including all of the panels. ​Co-founder Sean has finished his initial optical design of the main telescope, and is sending it out for review by our optics partners. We will be very busy over the next few months designing, building, and testing our space telescope, and we’ll keep you informed of our progress and plans. The funds from your investments were wired to us by Wefunder on Monday. The net amount was slightly over $156K. We are now busy putting the funds to work. We have hired two interns for the summer who will be working on laser communications and mechanical engineering of our spacecraft. 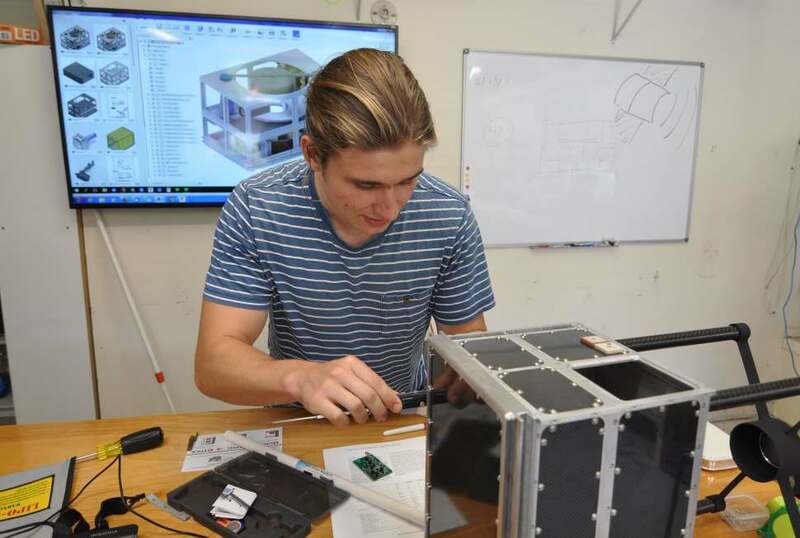 One intern is concentrating on mechanical and aerospace engineering at Cal State San Luis Obispo, where the cubesat standard was formulated. 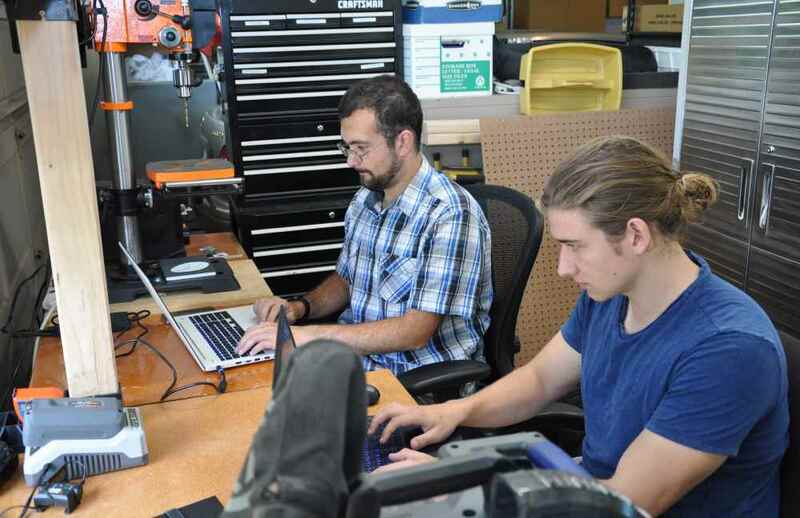 The second intern is concentrating on electrical engineering at UC San Diego, where there are student projects on 3D printed rocket engines, an autonomous rocket powered lander, and a mobile rocket engine test stand. Rather than spending any funds on renting an office, we are converting home space into a an office and a development lab. The office will be big enough for our interns, and will include an enclosed space for high speed laser communications testing. The development lab will have electronic benches for assembly, test, and rework of printed circuit boards with surface mount components. There will also be space for 3D printers, with one printer large enough to print the entire 12U spacecraft. And there will be enough space for a drill press, power saw, and other tools. We told you in our last report that we were preparing a proposal for the DARPA Blackjack program. We did receive feedback on our proposal abstract, and we were advised not to bother with submitting a full proposal, as we were wide of the mark. We did find the effort useful, though, and we have decided to make our laser communications bi-directional, so it can be used for both receiving and transmitting data either to the ground or to another satellite. We have also decided to make our satellite structure more manufacturable, by making it easier to assemble and dis-assemble. So we are now very busy preparing for our new interns, then we'll all be busy working on various parts of our spacecraft for the next two or three months. We want to thank our investors, customers, and supporters of our Waypoint space telescope for combined astronomy and ground observation. We really appreciate your support! We have reached 90% of our Wefunder crowdfund investment goal of $150K, with just two weeks left in the campaign. If you have already invested, we thank you, and ask if you could increase your investment. If everyone increased their investment by 10%, we will be able to successfully close the campaign. 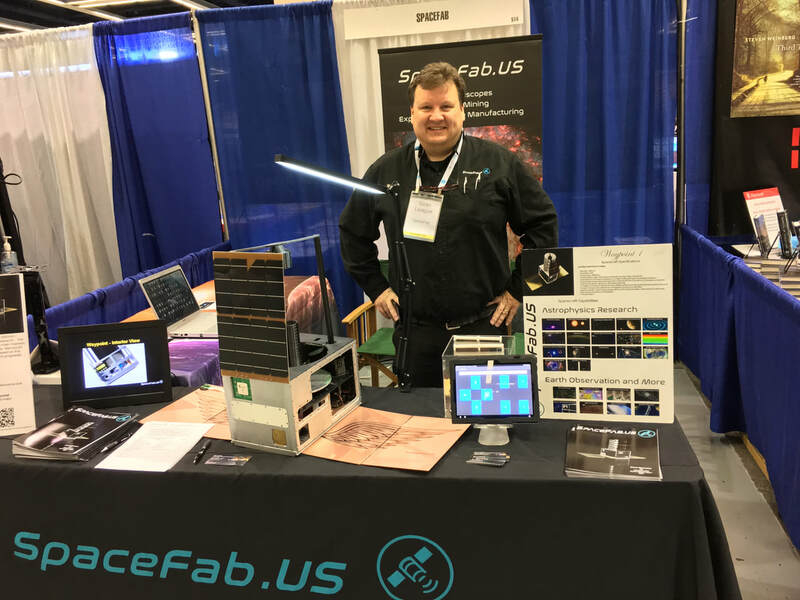 And if you haven’t invested in the SpaceFab campaign yet, please consider helping us build the first dual purpose space telescope that everyone can use, and own a piece of SpaceFab at the same time. We will be traveling to Washington, DC for a meeting at the DARPA Conference Center in Arlington, VA on March 15. DARPA (Defense Advanced Research Projects Agency) has a new program called Blackjack, looking for companies to help build a low cost constellation of 60 to 200 satellites in LEO (low Earth orbit) with enough capability to replace a single “exquisite” satellite design, but costing much, much less. 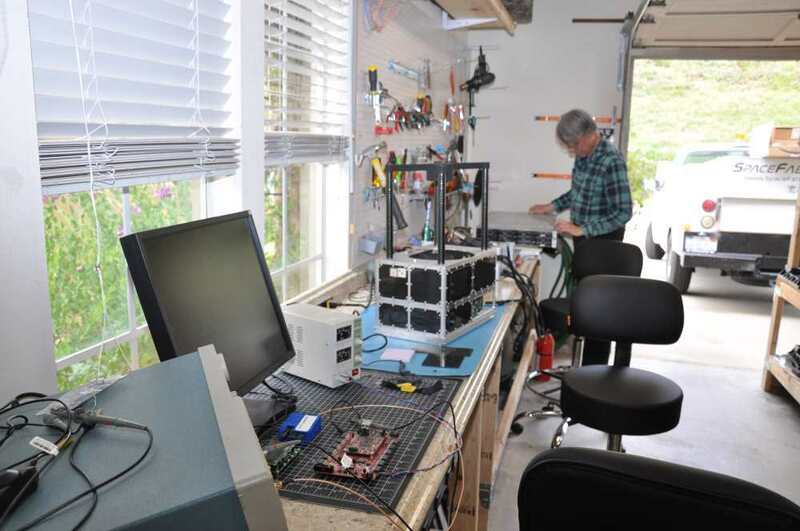 These small satellites must be large enough to have room for advanced payloads, yet small enough to be low cost. They should also be derived from commercial satellites. When we saw what DARPA’s looking for, we realized that our Waypoint Space Telescope is a perfect candidate. It uses the latest technology and is designed to be a very low cost commercial satellite with superior capabilities. DARPA is encouraging companies to team up, so we will be making a quick presentation about the Waypoint satellite, and looking for partner companies to join us in proposing a customized satellite for the Blackjack program. SpaceFab.US’ space selfie campaign is now open on Kickstarter! There are more than a dozen different reward levels, from space selfies to joining us at the launch of our first Waypoint satellite! Check out the SpaceFab space selfie campaign on Kickstarter to get all the details. If you have any questions, you can reach us at www.wefunder.com/spacefab, or at info@spacefab.us , we’d love to hear from you. Above is a link to our successful Wefunder campaign.